Samsung had announced that the upgrade cycle for its Galaxy Grand smartphone would officially end with Android 4.2.2 Jelly Bean. The last major update for the device is now seeding in Russia and the South Korean manufacturer is expected to roll out the Android 4.2.2 Jelly Bean ROM globally in the coming days. The latest update for the Samsung Galaxy Grand brings cool features such the lock screen widgets, advanced toggles menu, daydream screensaver, improved task switching and a few minor tweaks to enhance the overall user experience. As one can expect, the update also brings a few software goodies from the Galaxy S4, the company's flagship smartphone. 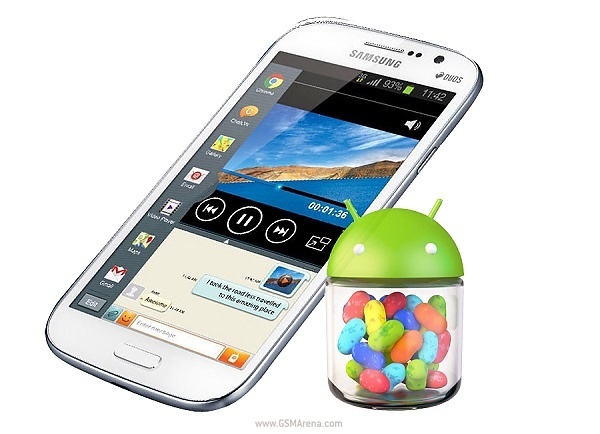 If you are in hurry and planning to jump the gun with the official update, then the Android 4.2.2 Jelly Bean firmware for your Galaxy Grand is available in the source link below. Just a friendly reminder: the flashing process involves some risk and may void your warranty. So, please continue with the instructions only if you are sure about what you are doing.